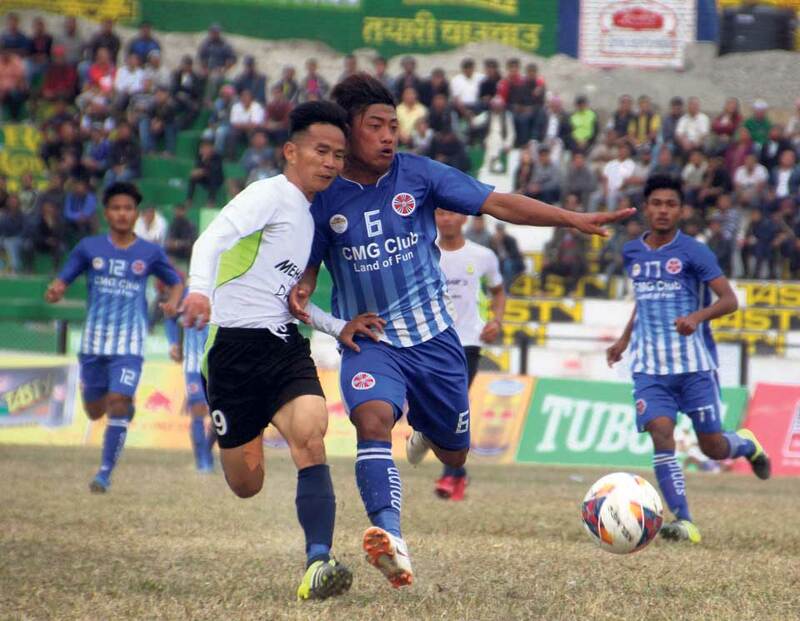 DHARAN, Feb 15: Host Dharan Football Club advanced into the final of the ongoing 21st Budha Subba Red Bull Gold Cup football tournament stunning A-Division runner-up Sankata Club 4-3 in the tie-breaker in Dharan on Thursday. The first semifinal match was pushed into the tie-breaker after the regulation time ended in a goalless draw. The game saw no addition of extra time due to limited time. Dharan goal keeper Binay Shrestha was the hero as he stopped two Sankata spot kicks. Sankata’s Amit Tamang, Dipesh Ale Magar and Laxman Ruchal scored, while Dharan keeper Shrestha stopped Cedric Aba’s and Saroj Dahal’s penalties. 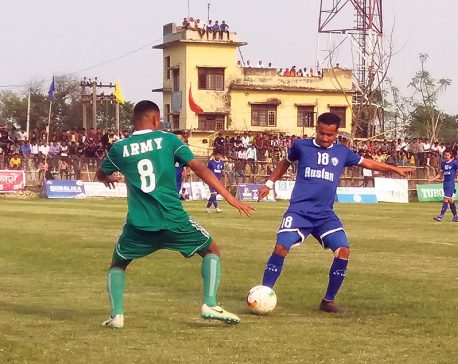 For Dharan, Bartaman Rai, Milan Rai, Yogesh Rai and Dorje Tamang scored, while Hemant Thapa Magar’s kick was stopped by Sankata keeper Raja Babu Thapa. Dharan has reached the final for the first time in 12 years. It reached the final in the first, second, fourth and eighth editions, but has yet to lift the title. Dharan has been facing criticisms for failing to win the title despite the tournament being played at home. 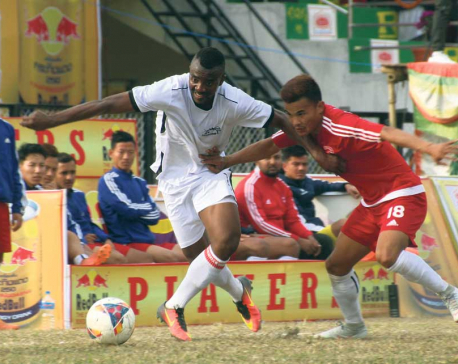 Dharan will now take on either Cameroon’s Dauphins Football Club or the departmental team Nepal Police Club who will face each other in Friday’s second semifinal match. The final is scheduled to be played on Saturday. Both the teams got enough chances to score in the regulated time, but could not capitalize them. Biku Tamang hit a shot in the fifth minute, but it was saved by Sankata keeper Thapa. Hemant passed the ball to Milan in the 26th, but he did not get his chance to shoot. Biku passed the ball to Bartaman, but his one vs one chance was saved by Thapa again in the 29th minute. Bartaman passed the ball to Hemant in the 48th minute, but his shot went over the bar, while Hemant hit a corner in the 76th minute, but the header from Bittu was easily saved by Thapa. For Sankata, Ruchal hit a shot from near the danger area, but his shot was brilliantly saved by Dharan keeper Shrestha in the 39th minute. Shrestha also saved a shot from Roshan Pahari in the first half injury time. Likewise, Dipesh’s shot was again saved by Shrestha in the 50th minute, while Subash Gurung hit a corner a minute after, and the header from Roman Limbu was caught by Shrestha. Also, Amit passed the ball to Aba, but his shot was punched away to safety in the 19th minute. Shrestha was adjudged the man of the match for brilliant shot-stopping performance and was rewarded with Rs 15,000.